The Inn is a home for up to 10 young adults, ages 18-30, who are in transition or in need of respite. Situation examples include unemployment, recovery from illness, and lack of affordable housing. Since its inception in 2014, more than 40 residents have benefited from life at the Inn. For 2018, rent, utilities, and program fees total $515 per month per resident (sliding scale program available). An Inn Director and on-site Residential Manager/Innkeepers facilitate group living. There are some policies, requirements, and chores. Rooms are double occupancy. Residents can stay for less than a month up to one year. Newberg one-bedrooms rent for $950 on average. Several months’ deposit and paychecks may be required, which is a large hurdle. Safe housing is key to health and success, but the Inn may close at the end of November. Pledges and projected rent cover 61% of the 2019 budget. The remaining amount is $23,000. If 75% of the budget has been raised, the Church of the Vine will be able to keep the Inn open. All funds raised will be used to cover budget items for the Hillside Inn. If the Inn should close, funds will either be used to "launch" the existing residents or donated to the women's shelter at Love, Inc. Thank you for taking the time to consider this small but vital ministry! For an application or more information see HillsideInn.org. It is with many mixed emotions that I write to tell you that late Friday night Church of the Vine’s board decided to close the doors of the Inn. While I cannot say that this was the “right” decision, I believe it was the better decision. While we witnessed many encouraging signs in the last 75 days that we would be able to transition the Inn from a ministry of CoV to a community non-profit, it was clear that we would be handing off a program more in need of rebuilding than simply it being a matter of continuity of momentum. Specifically, our total financial pledges only covered about half of the Inn Director’s salary, and none of the Executive Director’s support, and none of the ministry budget (meals, supplies, staff development, etc.). Also, we learned in the last few days before the decision that the Inn’s current Innkeeper (the on-sight community manager) was unsure that she would remain even if the Inn were to stay open. I am so grateful for each of you and your willingness to serve in this season of the life of the Inn. Thank you. Tomorrow, the Inn staff will be organizing our plans to care for the end of the Inn. This will include: 1) care plans for transitioning current residents on to a next step, 2) a celebration to be held at the Inn where we can give thanks for the last 4 years of ministry at the Inn, 3) logistical plans for an estate/garage sale and moving out of 602 N Main St. 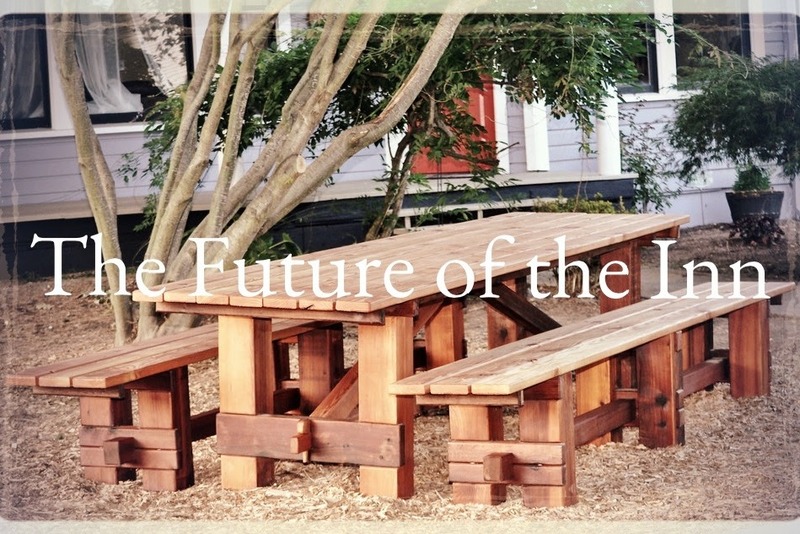 Since mid-September, we have been asking the question, what is "the future of the Inn?" During that time we have worked to recruit a community of monthly donors to support the Inn financially, and a cohort of leaders to serve on an advisory council. This need for a team, of both financial supporters and engaged leaders, is the essential requirement for the Inn to continue into 2019. The Inn's annual budget for 2019 is $84,350. As of today, and in just a bit over two months, we have been humbled and amazed to receive support pledges totaling $2,286.66 in monthly donations beginning January 2019. These pledges represent the support of multiple churches and local community members willing to invest in the mission of the Inn. Coupled with a three year average of rental contributions from residents, these pledges bring us to $54,824.89 in annual projected income, or about 65% of our 2019 budget. In order to green light the Inn for ministry in 2019, we gave ourself the benchmark that we would need to secure at least 75% of our budget, or $63,262.50, by Friday, November 30. The difference between these numbers is $8,437.61 ($703.13 per month). If you believe the ministry of the Inn should continue and would like to help by making a financial contribution, please make a pledge by clicking here. As of today we have recruited four members to the new Inn advisory council, with representation from Newberg's Churches, business community, and social service organizations. If the board of Church of the Vine (currently the entity providing legal and financial oversight to the Inn) decides this Friday, November 30th to approve the Inn for ministry in 2019, this new advisory council will begin a transition to take on the responsibility of overseeing the Inn. As it stands, the future of the Inn remains uncertain. While we are encouraged by these first steps toward sustainability, we are still a distance from a flourishing and fully-funded Inn. During this process we have taken stock of all that truly goes into running the Inn and determined that in order for the Inn to be a safe and effective ministry it will require a deepening of resources and a broadening of community support. If these resources and support step forward, the Inn will move ahead. Without them, we will close the doors of the Inn and celebrate the last 4 years of ministry on the corner of Main and North. I am grateful for the Lord's grace amidst these hard choices. May He be glorified in our decision this Friday. Thank you to all who have prayed, called, visited, and donated!